After weeks surrounded by nothing but water, I think it’s safe to assume that when the “huddled masses” made the first landing at the Statue of Liberty in 1886, no one among them was concerned as to whether or not they’d have water in the new world. Thankfully for them, American Water was already prepared! Yes, the American Water you know today has been around that long! In fact, this year American Water and the Statue of Liberty both celebrate our 130th anniversaries – 1886 marking the year our company was founded, as well as the statue’s dedication. During that era, the country’s population was growing rapidly, with Lady Liberty welcoming many new immigrants to a land of opportunity. Large tracts of land were being developed, and the need for water – and systems for its treatment and delivery – was growing rapidly. As I sat to write this blog celebrating American Water’s 130thAnniversary I began to explore what else American Water and the Statue of Liberty have in common – and I discovered the similarities to be quite significant. Engineering-focused. There is no questioning the Statue of Liberty is a marvel of engineering, its construction utilizing new engineering concepts in order to support its size, purpose and functionality as a “tour-able” statue. You can look back on virtually any American Water blog for a demonstration on how engineering and innovation also define who we are and what we do in order serve our communities, drive progress and help improve water on a local and global level. Still standing. Both the Statue of Liberty and American Water were established with the idea of being around for a long time. And here we are,130 years later! Why? A big reason is the value put on maintenance, whether that means replacing the torch to make it more architecturally sound, or in replacing and upgrading aging water infrastructure. Opportunity. To this day, people consider the Statue of Liberty as the gateway to the “land of opportunity” and the American Dream. American Water’s history is also rich in creating opportunities ranging from employment, to industry leading innovations, to community and governmental partnerships and more, all in the name of helping to assure water availability and sustainability. Adaptation, Change and Evolution. 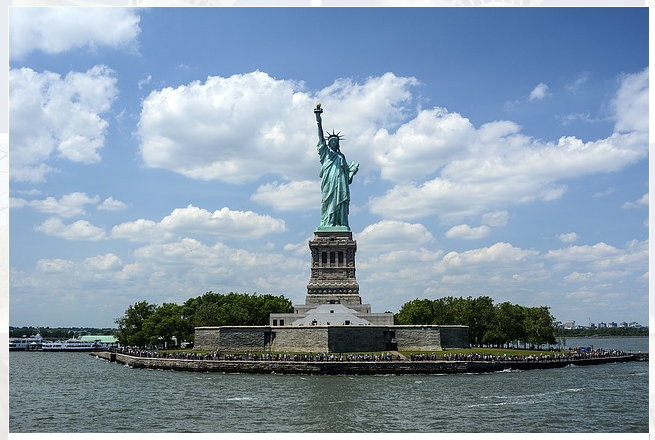 Through the years, the Statue of Liberty has stood the test of time and remained its iconic self by adjusting to everything from the wear-and-tear of climate and “traffic”, to what the market will bear in terms of costs to travel to and tour Liberty Island. The same can be said of American Water! We are able to make significant contributions to our industry and our communities by adapting to new situations, providing solutions for growing populations and evolving our products and services to meet the changing demands of the world around us. The Great American Melting Pot. If I could ask the founders what American Water was “all about,” at the beginning, surely water delivery to homes and businesses would be first on the list. I doubt, however, they ever pictured their company using digital technology for leak detection. I don’t think in 1886 they considered uniting with governments and advocacy groups to change the way people perceive and use water. But today, American Water has become a melting pot of the ideas, innovations, services and solutions that not only deliver water from point A to point B, but that advance environmental wellbeing and help assure a healthy future for water locally and globally. While those first immigrants in 1886 may not have thought much about the state of water in their lives, today water availability and sustainability are an inextricable part of life. I’d like to think that through our first 130 years, American Water has helped change that thinking while we also having helped alleviate some of the concerns. And just as the Statue of Liberty will surely continue to be a symbol welcoming people into a new world, American Water will continue to welcome our role in serving local water needs and driving innovative water solutions.